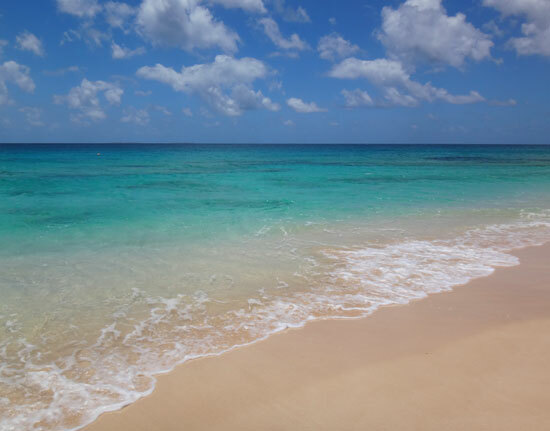 The beaches in Anguilla are many and each has distinct character. One thing they all share? They are all beautiful. 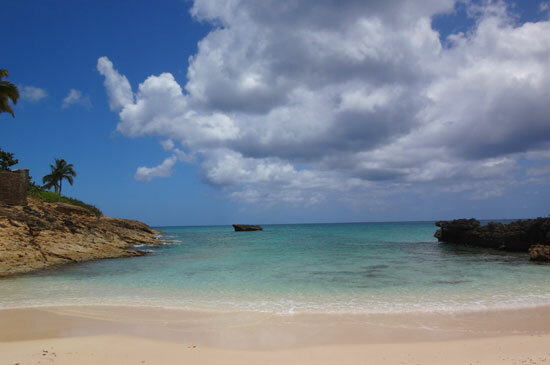 One of the more exclusive and less visited of Anguilla's beaches is Barnes Bay on the northwestern shore of Anguilla. Although lined with a large resort, more intimate hotels, a restaurant and private villas, you do not see many people on this long, straight stretch of sand. It's easy! Drive west along the main road in Anguilla and take a right when you see the sign for Mango's Restaurant. 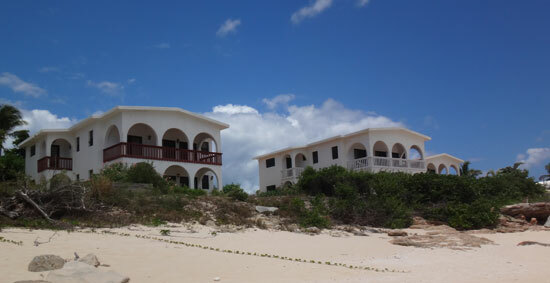 Drive down the dirt road until you see Caribella and Mango's (and the beach beyond). 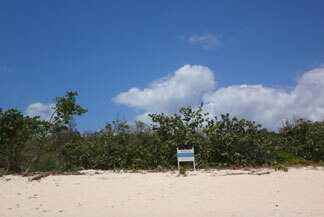 Beach access here at Barnes Bay is convenient and smooth, with the shoreline sloping gradually towards the water. 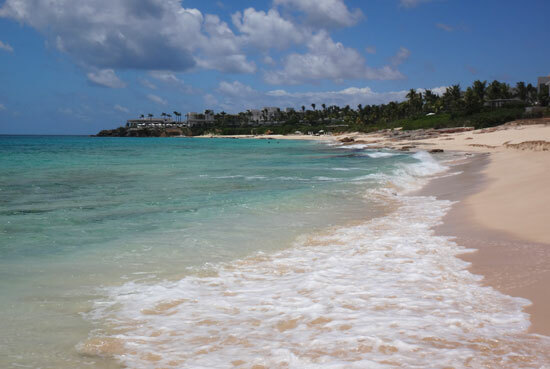 When you reach the beach and turn right, you are facing the eastern end of Barnes Bay, home to Anguilla's largest resort - Four Seasons Anguilla (formerly Viceroy Anguilla). Eastern half of Barnes Bay. Four Seasons Anguilla in the distance. 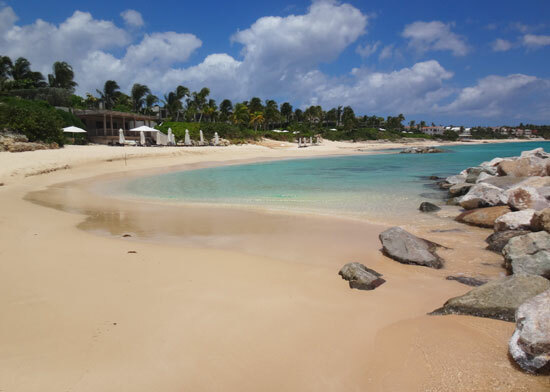 Four Seasons Anguilla covers a portion of both Barnes Bay and neighboring beach, Meads Bay. While the Four Seasons end of Barnes Bay might be where you see the most people on this beach, it's still the quieter side of Four Seasons. 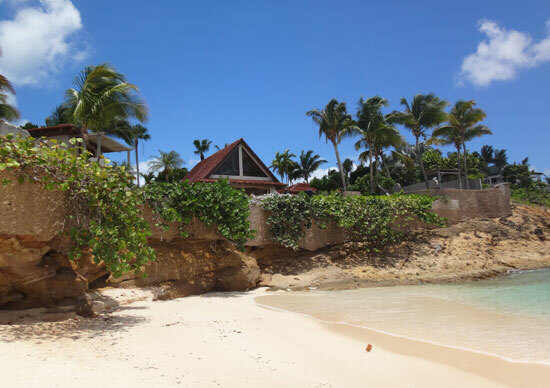 Most guests spend the day at the beachside pool on the Meads Bay side. The Barnes Bay side of the resort is home to the resort's beachfront private villas and small day-time restaurant, the Half Shell. Four Seasons occupies a little less than half of Barnes Bay. Though a bit rocky, it's not a treacherous walk to that end of the beach as there is plenty of sand covering the rocks. 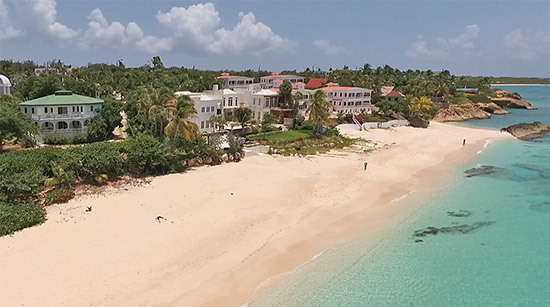 Barnes Bay's eastern side has been known to change depending on the swells and tides, and has transformed more of the years as Viceroy, who managed the property prior to Four Seasons' take over in 2016, built rock breakwaters in front of their property line. The breakwaters have created small, shallow, clear sea pools between the rocks. Although Barnes Bay is more of a straight walking beach, these adjustments have given this end more curve. While facing east, look up to see the resort's main gathering spot, the Sunset Lounge. Pivot and turn back to where you came from and you are facing west. On your left, private Four Seasons villas line the dune with some more hidden from the beach than others. They consecutively line the beach, past the Half Shell, and they stop where you'll find a smaller and more Caribbean-style hotel - Caribella. Reasonably priced, with lots of space inside the units, and with a pristine location, these apartment style accommodations on mid-Barnes Bay are terrific. 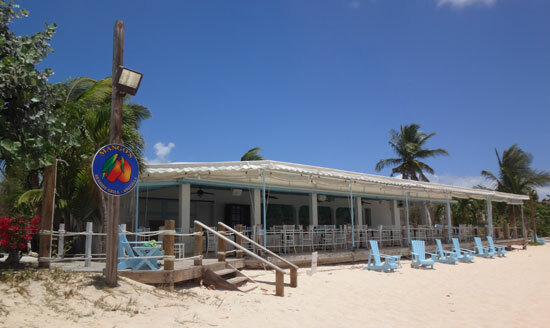 Caribella is located next to the only privately owned restaurant on Barnes Bay - Mango's. Mango's is open for lunch (high-season only) and dinner and owned and operated by the lovely Dave and Kim Coburn. Its proximity to the sea provides some of the most soothing sounds as you dine, and their fresh tartare of the day never disappoints! After Mango's is just raw beachfront land, the only lot without a building on it. Beyond this stretch of beachfront real estate are all high-end villas, one more reasonably priced hotel and one affordable villa rental. 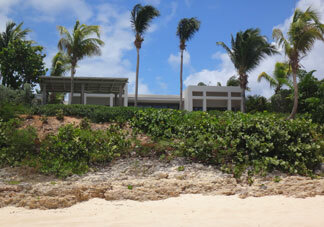 Next to Limin' House lies a real gem of an Anguilla villa, Beach Villa Ella (see green house on left of photo below). 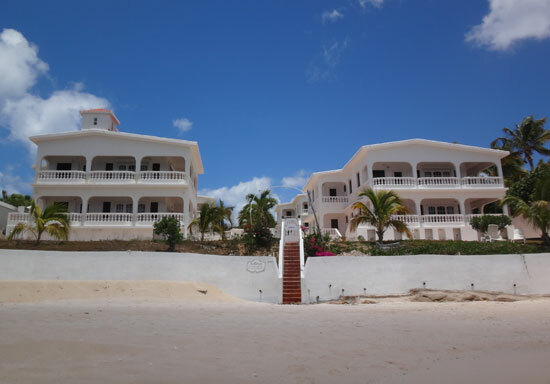 Affordable, spacious, with all of the comforts of home, and with Barnes Bay right at your finger tips, it is one of the best value rentals in Anguilla. Of the high-end villas lining the western end half of Barnes Bay is the better-known, ultra-luxurious Cerulean Villa, just next door to Beach Villa Ella. Over the years Cerulean has hosted a number of celebrities and seen major renovations. Today, its Christmas rates start at $250K/week. Between Cerulean and the last private villa on the beach is ArBron Villas. Caribbean-style efficiency apartments, ArBron rents a number of clean units at moderate prices. The top floors offer beautiful views out to sea, and, of course, the ones on the lower level are closer to the beach. 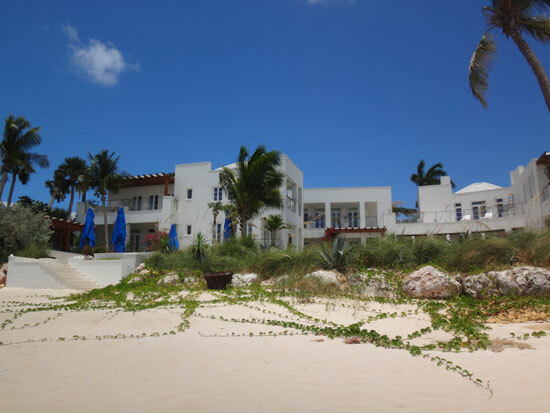 The last high-end villa seen from the beach is privately owned and is one of the more unique ones. You can easily see the center A-frame building even though it sits on a bluff above the sand. Further along that stretch, and mostly out of sight (when looking up from the beach), is another high-end villa that was once listed for €250 million. 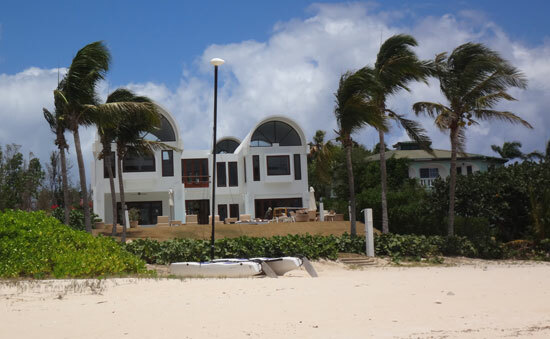 It truly is a posh end of Anguilla, frequented often by the jetset. You can read a family friend's story on his celebrity encounter on Barnes Bay, here. This bluff is where Barnes Bay beach ends. 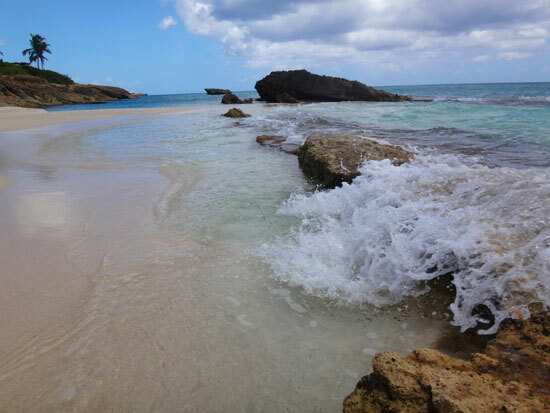 This end of the beach, unofficially referred to as the "cove" faces west and is a perfect end cap to this breathtaking stretch on Anguilla. Watching the sea water flowing over Barnes' long west-side rocks is a special sight, too. It's never easy to turn and walk away from this end of the beach! 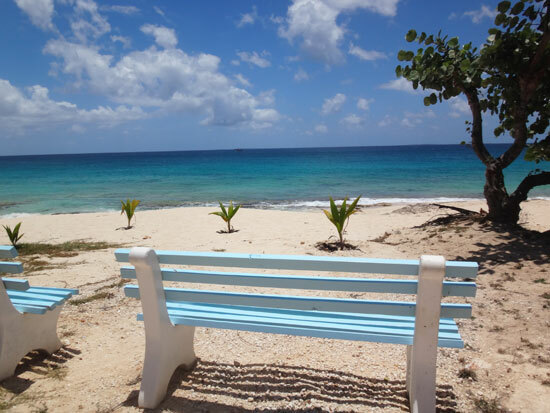 Barnes Bay is a tranquil, upscale escape, another perfect spot to spend a quiet day at the beach. 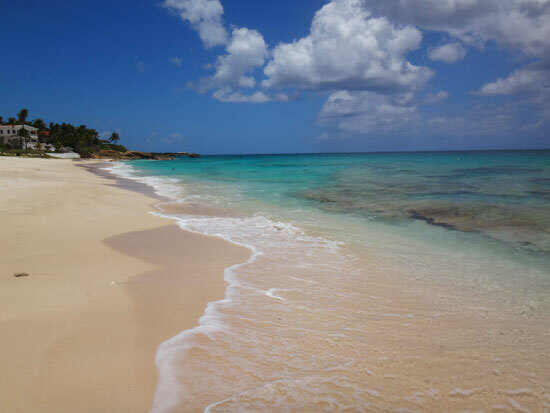 When you visit Anguilla, make a visit to Barnes Bay if you can!